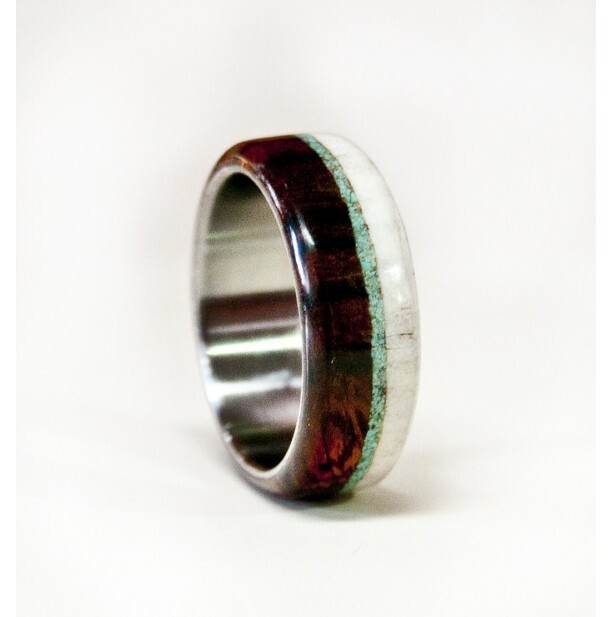 Made from naturally shed deer/elk antler found in the Wasatch Mountain range around our home and desert Ironwood, this ring features an inlay of hand crushed turquoise. we have green and blue turquoise available for inlay. All materials are collected ethical and cruelty free. 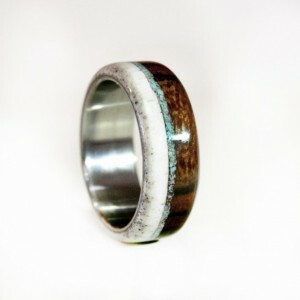 Everything is started from raw materials and is handmade by one artist (Me-Brad). After being sanded to a silky smooth finish I apply a protective sealant. The sealant adds a lustrous shine and protects against water. We started adding the titanium as a peace of mind. Wood rings simply cannot take the abuse a metal ring could but we wanted to maintain the organic natural look but add some durability. 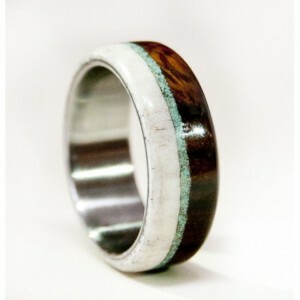 sizes 2-15 available 4-14mm width available Please be certain of your size before ordering as I cannot resize this ring.